"This is a great east meets west dish. 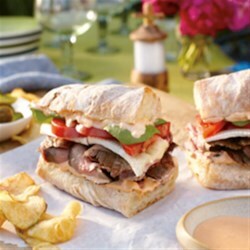 It's a steak sandwich kicked up with Kikkoman Sriracha Mayonnaise!" Pulse all marinade ingredients in blender until a rough paste, scraping down blender jar as needed. Combine marinade and meat in gallon-size zipper-lock bag; press out as much air as possible and seal bag. Refrigerate 1 hour, flipping bag after 30 minutes to ensure that meat marinates evenly. Drain and discard marinade. Grill steak, over medium high heat for 7-9 minutes on each side or until meat reaches desired doneness. Let rest for 10 minutes before slicing. Transfer steaks to cutting board; tent loosely with foil and let rest 5 minutes. Slice steak very thinly on the bias. Split Loaf, brush a bit of oil on the inside, and grill for about 1 minute until warm and slightly toasted. Mix together the Kikkoman Sriracha Sauce and mayonnaise, and smear onto the toasted bread. Compose your sandwich with sliced steak, arugula, and brie. In a few hours and with virtually no effort, you can have flank steak pastrami. Created by Chef Jet Tila and inspired by Kikkoman.